Bananas are very popular in our home! I like to keep them on hand on a regular basis, and these mini banana muffins are hands down our favorite muffins to make using the over-ripe bananas. 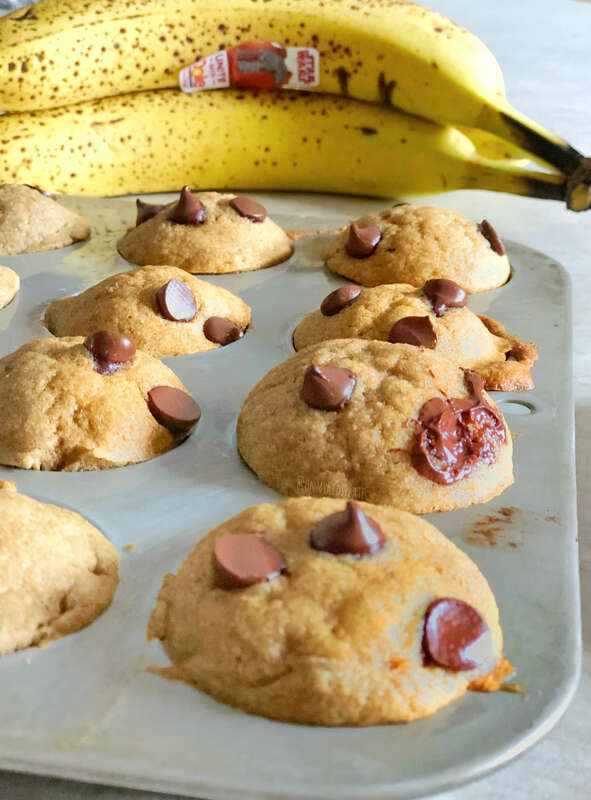 These mini banana muffins are super moist, have little bits of chocolate chips throughout and make a perfect treat for play dates, quick breakfast options, and even toss in your child’s lunch. Play dates are the ultimate entertainment for your child, plus it isn’t too shabby for the parents either. In our home we count down till the next play date, it is always a fun adventure! Playing with friends is a blast and helps all of us break up the week. With fun costumes, block towers tumbling over, and the laughter of little one’s warms my heart. I love when we have new kids join in on the play date, it’s like a breath of fresh air. The more, the merrier in my eyes. 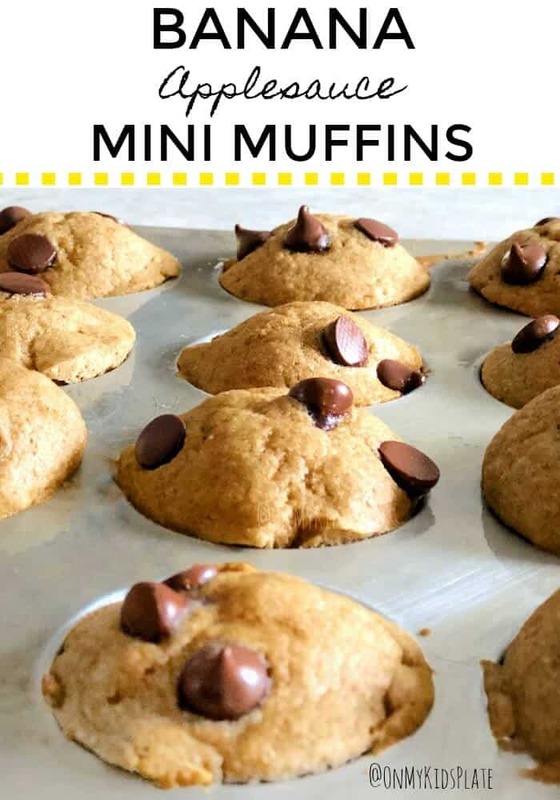 With all that fun playtime comes some rumbly tummies that need a tasty snack, and that is where my mini banana muffins come in. These bite-size muffins are delicious, and the kids and parents will both be reaching for seconds. I am all about having snacks available during play dates when people come over. With all that playing the kids need to have food to give them a boost and water to hydrate. Plus my helper always ensures there are three chocolate chips in each muffin. Your kids will have a blast helping make these muffins. They are super easy to whip up, and the flavors are perfection. So grab a bowl, spoon, measuring cups and roll your child’s sleeves up. Let them help you make the perfect treat to go along with their play date. I substitute applesauce for the oil to help make them a bit healthier, and no one will ever know. The chocolate chips add the perfect amount of sweetness, and your kiddo can practice their counting skills. We do three chips per muffin, but your welcome to do as many as you want. What is so great about these muffins is you can make ahead of time, serve up for breakfast with some fresh fruit, or slide into your child’s lunchbox. Freeze these mini chocolate chip muffins and just thaw and serve when you want. 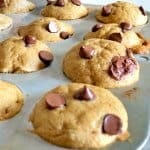 I love making a big batch of our favorite muffins and cookies and then freezing them, so on days I might forget to whip up a treat for our next play date, I have goodies stocked. I am sure you and your family will enjoy these bite-size mini banana muffins. They are our go-to muffin, toss in a few chocolate chips, or even add some nuts for that crunch factor. You can never go wrong with mini muffins in our house. The mini size makes them extra scrumptious. In a large bowl, combine flours, baking soda and salt. Stir until combined. In a separate medium-sized bowl, scramble too eggs with a fork. Using the back of a fork, mash bananas until smooth without chunks. Add to egg mixture. Add applesauce, honey, vanilla to the egg and banana mixture. Mix well. Combine wet and dry ingredients in the larger bowl. Stir until combined with no lumps. Using a spoon, portion batter into mini muffin tins. Sprinkle mini chocolate chips on the tops.